Two of the largest players in the New England natural gas market have formed a partnership to expand the capacity of two major pipelines, they said Monday, the latest of several proposals to increase the supply of natural gas to the region and moderate the costs of heating and electricity. The pipeline operator, Spectra Energy Corp., of Houston, and Northeast Utilities, the parent of Nstar and Western Massachusetts Electric Co., said they will invest $3 billion in a project to bring an additional 1 billion cubic feet of gas a day into New England, or enough to supply about 3.5 million homes. The lack of pipeline capacity has become a big problem for the region as businesses, consumers, and power generators have increased their use of the lower-cost fuel, leading to supply shortages and spikes in wholesale prices for both gas and electricity during extended winter cold snaps. During one period of low temperatures last winter, wholesale electricity prices briefly shot up to $1,290 per megawatt-hour — compared to a yearlong average of $36 — because of a natural gas shortage. The price of natural gas has plunged in recent years as the controversial drilling technique known as fracking has opened vast reserves in Pennsylvania and other states, but New England has been unable to take full advantage of falling prices because of pipeline constraints. 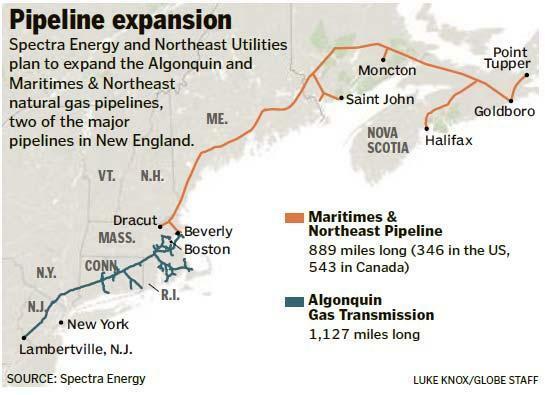 Spectra and Northeast Utilities plan to expand the Algonquin pipeline, which runs from New Jersey to Everett, and the Maritimes & Northeast line, which carries liquefied natural gas that is pumped from ships anchored in the waters off of Eastern Canada. The project, if approved by the Federal Energy Regulatory Commission, which regulates interstate pipelines, would be completed in 2018, company officials said. May said the project cost would be recovered from customers over the first year following the project’s completion, as is typical for such capital investments. Caroline Pretyman, a spokeswoman for Northeast Utilities, said that company did not know how much it would increase customers’ bills, but she said it would lower bills over the long-term by increasing access to cheap natural gas. Northeast Utilities has more than 3.6 million electric and natural gas customers in Massachusetts, New Hampshire, and Connecticut. The project, called Access Northeast, has not been formally proposed to the FERC, but Gregory L. Ebel, Spectra’s chief executive, said they would probably begin the process sometime next year. Expanding the pipelines’ capacity would entail upgrading compressor stations and replacing pipe sections of the Algonquin and the Maritimes & Northeast, Ebel said. The Access Northeast project would complement an earlier proposal by Spectra to expand the Algonquin pipeline by 14 percent by adding 40 miles of pipe and installing new compressor units, company officials said. If it is approved by the FERC, the project is scheduled to be completed in the winter of 2016-17. Another pipeline project for New England is also on the drawing board. Kinder Morgan Energy Partners LP, a Richmond energy company, proposes building a pipeline to supply gas from Pennsylvania across New York and Western Massachusetts. That proposal has run into heavy opposition from residents who live along the planned route. A Kinder Morgan filing with FERC on Thursday said the company would seek public input later this year before filing its pipeline application in September 2015. Correction: Due to a reporter error, an earlier version of this article wrongly described a proposed expansion of the Tennessee Gas Pipeline through western Massachusetts as two separate proposals.